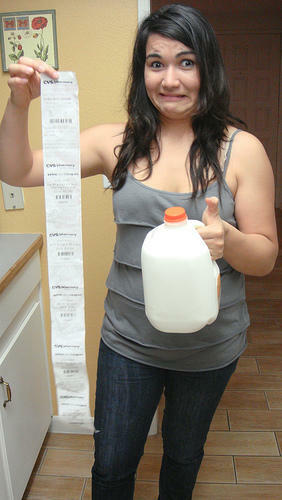 Vox's hilarious story about the ridiculous length of CVS receipts – the height of a small child? the length of a sofa? – failed to mention one of the more pressing concerns about being handed a ream of thermal-sensitive paper upon checkout: Exposure to bisphenol-A, or BPA. Most receipt paper is imprinted with BPA. When heat is applied, it bonds with a clear dye coating the paper, turning the dye dark (You can see this vividly in the Vox story, where the author ironed a CVS receipt to better measure its length and the receipt turned black). Abundant science shows that the chemical – an endocrine disruptor shown in lab tests to disrupt metabolism, reproductive and immune systems – easily migrates from paper to skin. A 2012 study estimated that 88 percent of our exposure to BPS, a close cousin to BPA, comes via handling receipts. And scientists have concluded that we all have trace amounts of BPA and/or its cousins, BPS and BPZ, among others, in our bodies. In January, editor Brian Bienkowski wrote about a study in Michigan that found 93 percent of all paper receipts contained hormane-altering chemicals. And last month Chemical and Engineering News reported that elevated levels of BPA picked up from receipts can linger in the body for a week or more. Which makes us suggest that there's got to be a better way for CVS to get coupons and alerts into the hands of its customers. Read the, ahem, lengthy story on CVS's receipts on Vox here.